Seems that people like others to live in neat little boxes, to work regular hours, to have a job or kids at home to fill their time. I like titles too. I tend to categorize people—“She’s a doctor;” “He’s a plumber.”—just as much as the next guy. Yet, my season of life right now can’t be categorized. I’m not working for pay, but I’m busy every day. I’m not a teacher, but I am still a mother, a volunteer, a board member, a writer, a mentor. I’m also getting ready to do something really hard: let go. My nest will be empty this fall, and for as much as I feel excited about this new phase of life, I know it will be hard. I’ll have days when I will just have to push through, to gut it out, and to just make it to the next day. I’m not kidding myself here. It will be hard. It takes preparation to do hard things. It takes training. It takes practice. It takes prayer. This past weekend I was deeply privileged to take part in a very special ceremony. 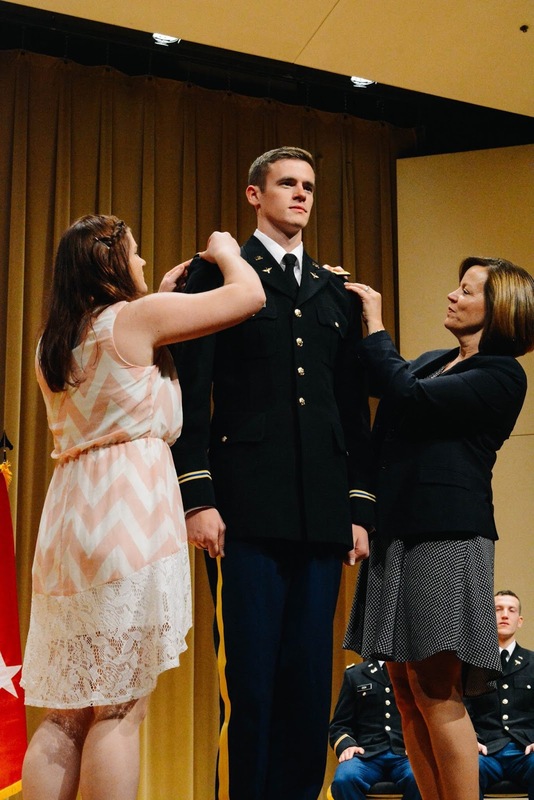 A young man whom my husband and I have mentored for the past three years was commissioned into the Army as a Second Lieutenant. A few weeks prior to the ceremony, Sam asked if I would help out by pinning the shoulder board onto his uniform during the ceremony. Usually this is an honor reserved for the mother or girlfriend of the cadet, but since his mom couldn’t be there that weekend, he asked me to stand in. Sam’s sister and I pinned those boards, one on each side, like we were champs, thrilled to have a small part in the service. It felt significant, like we were helping launch him into this next phase of life. Later, his dad, a retired Air Force Colonel, administered the oath of office. I watched as our dear friend, handsome in his uniform, stood in front of his father and those gathered in the auditorium, raised his right hand, and took a most solemn oath of allegiance to and protection of our country. I could not have been prouder. I’ve thought many times over the past few days about this hard thing he is doing. He has already practiced for four years. He has trained, hard. And I’m sure he has prayed quite a bit about this next step he is taking. But it won’t be easy. He will have days when he will wonder what he’s done, when he will want to quit, when all he can do is rely on the training he’s received and just keep going. This commitment he’s made is not easy, but it is to a cause greater than himself. I am so thankful for the men and women who make such a commitment to our country. In other words, keep at it. Stick to your commitments. Say you’re sorry. Grant forgiveness. Whatever it is that seems hard right now is probably the right thing to do because what I’ve learned is that the good stuff of life never comes easily. It takes time, dedication, commitment. It takes a character that has developed over time, one that will last. And developing character? That’s hard. But the rewards? Oh, the reward of knowing you’ve done the right thing is so worth it. As for me, I’m going to do that hard thing (OK, two hard things) this summer. I’m going to send my last daughter off to college, and I’m going to help another daughter move across the country. I’m going to keep my chin up and not whine or complain. I'm going to let go of my children this summer like it's my job . . . and it is! Because I know that what’s best for my children is to pursue their dreams, and they can’t do that sitting here at home. They need to be free to fly. Without reservation. 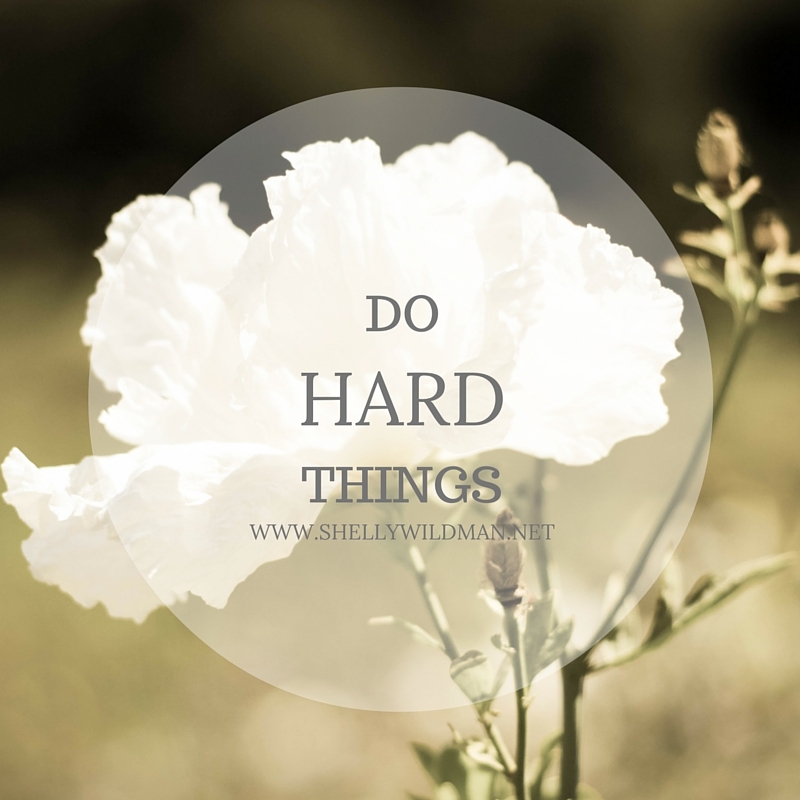 What's hard for you right now? Maybe it's getting up night after night with a newborn. Or watching someone you love walk through a cancer diagnosis. Maybe you've been given a not-great diagnosis yourself. Or maybe it's just getting out of bed to face another day full of really hard things. Your hard thing may not be the same as my hard thing, but each of our hard things make us who we are. People of character. People of commitment. People who see beyond our own needs and act for the greater good. Persevere, friend. Carry on. And pray like crazy. Thanks, friend. I needed this. So good, Shelly! Character building... hard, but so good. Thank you for the encouragement. I was almost at tears at the end thinking of your empty nest, but I know you will go through this in a beautiful way, providing an example for us who will follow. Thankful for you! Praying with you, sweet Shelly.